25 Endearing Mason Jar Christmas Decor Ideas That are Another Word for Enchanting! Home » CHRISTMAS DECORATIONS » 25 Endearing Mason Jar Christmas Decor Ideas That are Another Word for Enchanting! Whether it’s presenting your loved ones with adorable Xmas gifts packed in cute jars, or pulling off decorative pieces for getting the house all set for the festive days, mason jars are the king of disguise to serve each of the purposes. 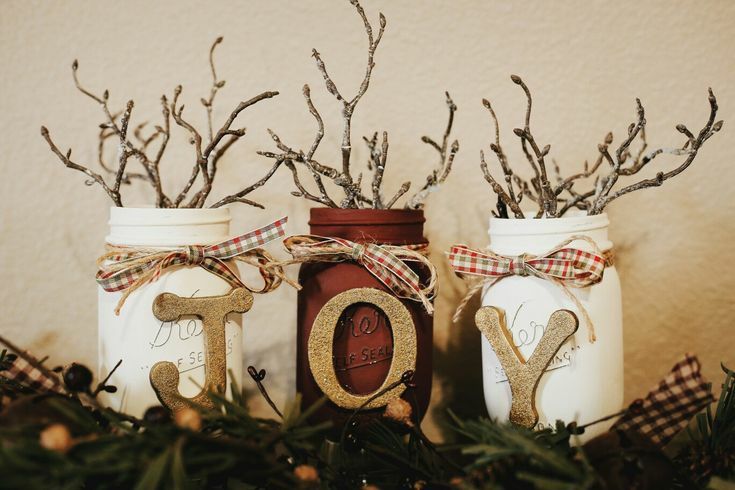 Check out these endearing mason jar Christmas decor ideas that are a synonym for enchanting! A mason jar disguised as a table-top candle when coupled up with a few more clones of itself forms the best ever Christmas lighting decor for the house. The jar is lined with a strip of lovely patterned fabric in red, white and green, having a final wrapping of twine and a pinecone around itself. Painting the jars in the christmas tones and flaunting the festive spirit by the word ‘joy’ embellished on them makes up for a perfect christmas decor as it beautifully depicts the vibe of happiness that is seen all over. The added element by the bows and twigs brings remarkable gorgeousness. No matter how many christmas trees you put, its never enough. So what can be better than making a little christmas tree in a mason jar which looks absolutely stunning and can be put indoors without occupying much space. The beauty is magnified by the huge ball hung on the rustic twine. You can put together a little piece of decor by just using some wood, a mason jar and some decoratives that reflect the christmas vibe. All you have to do is attach the wooden pieces in the shape of a christmas tree along with a stand where the decorated mason jar will house a little candle. When it comes to keeping it simple and light then this idea is a must for you as it requires absolutely no work. All you need to do is gather mason jars and fill them with candy cane that face outside the rim of the jar. For added look, put some christmas tree branches with them to beautify the setting. What can reflect the perfect christmas vibe if there is no snow! Get on with your DIY skills and make these gorgeous luminaries that flaunt the snowy weather amazingly. To make it rustic, add two snow drenched pinecones tied by a string of twine. The golden glow showered by a lit candle looks just so serene and beautiful, so a little township created in a mason jar does wonders as the little silhouette when illuminated by a candle reflects the tiny town everywhere making it even more pretty. Just simply filling the jars with huge bunches of berries and a little epsom salt for the base to make snow, gives amazingly pretty results that look so cute to look at. The red berries depict the christmas vibe and the salt makes a contrast. Accompanying them, mason jars with lit candles also illuminate the arrangement. If you are looking for an incredibly easy and budget friendly decor item then this idea is your thing as all you need is a mason jar and lots of epsom salt along wth some embellishments. Cover the mason jar with epsom salt for the snowy look making it look extremely stunning. Mason jars make the best snow globes as they already fit perfect for the different shapes of a globe. All you have to do is start by collecting the items that you want to display in your globe and artificial snow is the must. We all get magnificent christmas trees to adorn our decor and house so what can be better than placing a little car carrying a christmas tree for the festivities in a mason jar with lots of snow and some embellishments to add more beauty. Keeping it simple and light, this idea here features cute mason jars dressed up as a snowman with a candy cane kind of printed ribbon as the scarf and a little branch of a christmas tree that adds the most loved element about the festival. You can turn that little table top mason jar to a beautiful lantern that can be hung anywhere. All you have to do is cover your mason jar with epsom salt and for added beauty tie a rustic twine ribbon accompanied by little greeneries. Attach a handle to it to complete your frosty lantern. Music brings life to anything just like these rather simple mason jars. When a music sheet with a little window for the light to peep through is stick to a jar, it looks completely unique and oh so gorgeous as it is completely different and pretty. Flaunt the christmas colors with this vibrant mason jar that is completely coated with a red tone accompanied by lots of snowflakes falling from the sky. The look is completed by the twine along with two bells, white and red, adding the right icing on the cake. Give an all new purpose to the mason jars by transforming it into an even more gorgeous candle holder which steals the show. Fill your jars with snow, berries and tiny branches. Place the candle at the rim of the jar and complete the look adding a rustic twine rope to the lid. The mason jars come with versatile options as they can be filled with treats or adorned with little greeneries or simply be gifted as gifts. These christmas jars here flaunt the blend of the rustic burlap strip with the tones of the festive occasion. A little glitter makes everything look extremely gorgeous and pretty, just like these mason jar turned center pieces where a pinch of glitter does wonders for the decor. You can choose to cover the entire jar in glitter or simply spray paint a coat over it. Flaunting snowflakes and the beautiful look of the snow by the jar makes it absolutely gorgeous and a perfect item for the decor. You just have to paint the snowflake on the jar and cover the entire jar in salt for the effect of snow. Making lots of decorative items for the Christmas season is extremely fun and we all love to do it and what can be better than the easy to make pieces that result in something amazing. The idea here features a simple red jar that is painted white in alternate strips to turn it into a candy cane. Bunches of mason jars hung as a little gorgeous chandelier looks amazing and the rustic touch brought by the twine handles and the burlap cloth holding each jar together makes it even more eye catching. The string lights do their thing and create magic with their golden light. 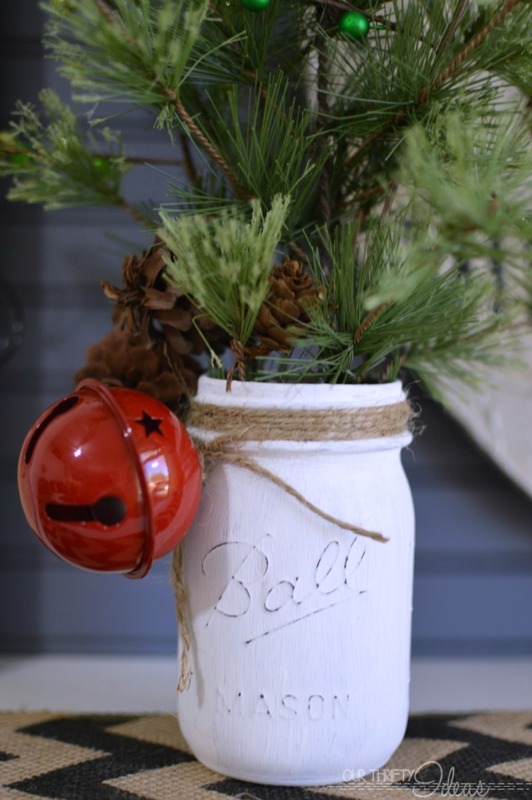 Transform a simple jar to the one thing that every kid loves about christmas the most, The Santa Claus! All you have to do is paint the jar in red and put a black ribbon as the belt. Put two buttons on the stomach of the jar and cover the lid with a white and red ribbon to complete the look. By giving a mason jar the face of a snowman make a extremely cute and funky decor piece by simply painting the jar in white paint and making a snowman face with a carrot nose. Cover the lid with twine and fill the jar with anything you like. Blending the concept of the vinyl alphabets, you can make use of such shapes from anywhere just like in the idea here which used a bell shaped label on a box and attached it to the jar for the paint job. Later give the golden outlines to the shape to complete the look. Bring the christmas adventures to a box by making the silhouette designs that beautifully reflect a little town or theme of the festive season flaunting the major elements. You can make your own designs for your jars depicting the parts that you like about christmas. Why struggle to adorn the mantel or make the center table sparkle, or make the friends and family feel more loved with a handmade gift when you have got such wonderful mason jar Christmas decor ideas on hand?